Just as with plumbing, a commercial roof always fails at the worst possible time. You will long remember the holiday or weekend that was ruined when you were notified that your commercial roof needs emergency repair. From a leak to wind damage, many conditions can require an emergency response from your commercial roofing contractor. We are extremely dedicated and ready to answer your call, no matter the hour or day. Our 24/7 emergency response team is always ready to take your call. We often can get to your roof the same day you call, weather permitting and safety margins allowing. A building whose roof has sustained major damage may not be safe, either for you or for our expert teams of roofers. We want to help you restore your business, but we also will keep our roofers safe. Once the weather permits a visit, we will assess the damage, including any safety issues, and make recommendations. We can complete many repairs with just the one emergency response. Other problems may be more widespread or call for substantial tear-off before a flat roof replacement is completed on your roof. Under those circumstances, we will make temporary flat roof repairs to preserve your business, then work with you to schedule permanent repairs. Weather is not the only reason for emergency roof repair. Outside vendors may cause unintentional damage to your roof, or airborne construction material could strike your flat roof’s surface. Nobody can schedule an emergency, but we work hard to schedule our emergency response. Whether you face a weather-related roof problem, or suffer unexpected damage from other causes, we are here to help. Contact us today to learn more about our emergency service. Storm damage can happen to anyone. Preventing flat roofing storm damage—snowstorms, tornadoes, downpours and hurricanes—requires a two-fold approach. In the case of a roofing emergency, don’t hesitate to call us 416-238-6668 for emergency response. Have emergency roofing services already in place — Do you really want to be scrambling to find a commercial roofer when your flat roof is leaking water onto your inventory or equipment? 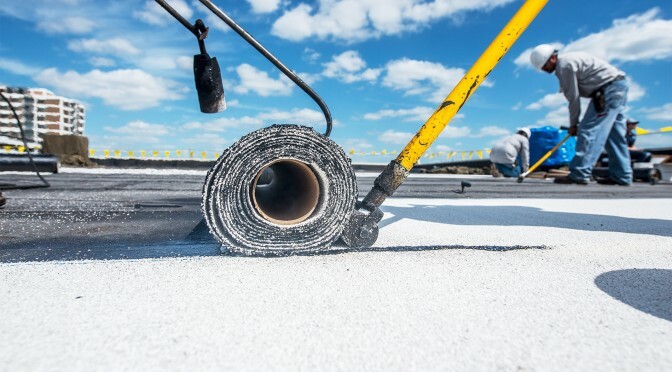 Arrange Emergency Flat Roofing Services ahead of time, by developing a strong relationship with a carefully screened commercial roofing contractor. Get regular inspections to check for roof damage — Annual or semiannual inspections can prevent the most expensive types of flat roof repair, by catching and correcting small issues before they grow into major roof damage. Remove hazards—Overhanging limbs, close trees, weak roofing sections and improperly anchored add-ons (HVAC equipment, satellite dishes, electrical signs and window-washing equipment, for example) all can cause blunt force damage to any flat roof. No matter the age, type or condition of your flat roof, additional applications of waterproofing can make sure your roof is in tip-top shape ahead of severe weather. 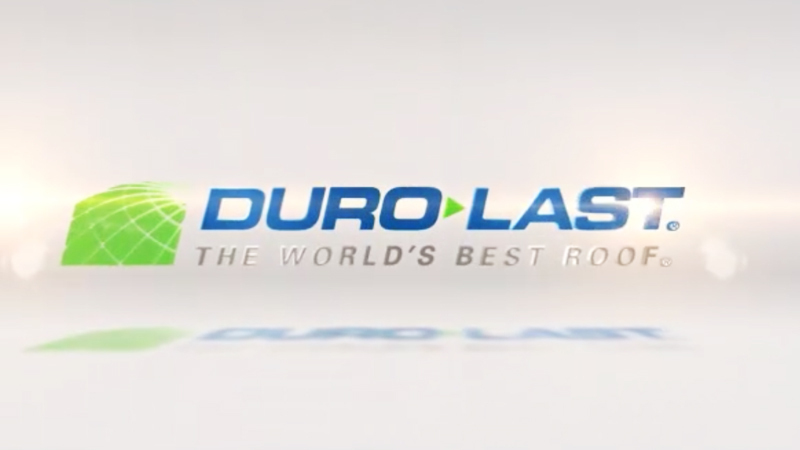 Low temperatures cause cracking in asphalt-based roofing materials. High temperatures lead to crazing and bubbles. Getting regular spray or brush coatings of waterproofing will ward off moisture, adding years of life to your roof. 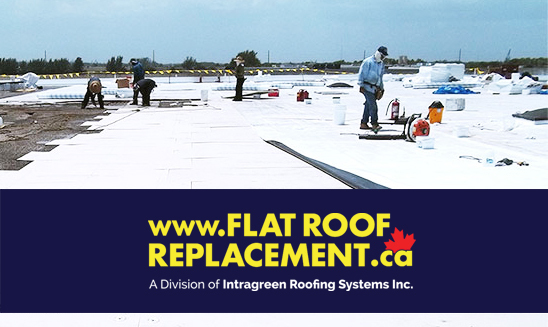 FlatRoofReplacement.ca can perform regular inspections, make small repairs, provide emergency services when storms do strike, and help keep your business afloat under the most adverse circumstances. We do more, too: we can provide roof monitoring services 24 hours a day to track ice and snow loads. Contact us today to see how we can help you build a strategy for success in preventing storm damage to your flat roof. Bitumen is a heavy petroleum product. It is great for sealing out water, resisting changes in temperature, and providing long-lasting, flexible roof protection. 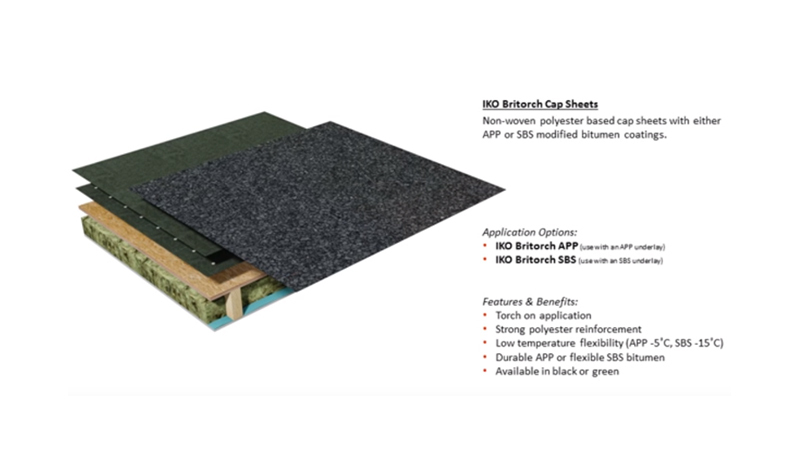 Modified bitumen roofing material keeps all the best qualities of this petroleum product but modifies it by adding long-fiber rubber compounds or polymers for strength, elasticity and workability. 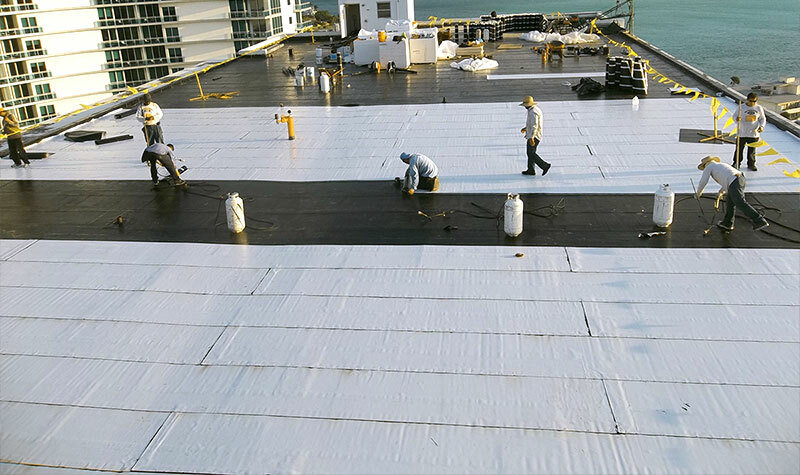 Sheets of modified bitumen roofing membrane are made in a factory under carefully controlled conditions and spun into convenient rolls. FlatRoofReplacement.ca can get them up your flat roof by freight elevator, ladder hoist or, if necessary, by stairs. We lay the rolls out rapidly and seal their laps using heat welding (torch application). Although we often refer to our products using these abbreviations, we are always happy to explain what our industry lingo means, and why either APP or SBS is the right choice for your commercial roof. Your flat roof can take on just about any final appearance you would like, because the top of the membrane can be treated with granulated minerals or metal foils in a wide range of colors, including cool white to help lower cooling costs. Having professional, commercial roofers perform an annual inspection is economical, since small issues can be repaired efficiently before they become major problems or lead to leaks. FlatRoofReplacement.ca can install your modified bitumen flat roof, help you maintain it, and advise your maintenance department on carrying out semi-annual or quarterly inspections and repairs. 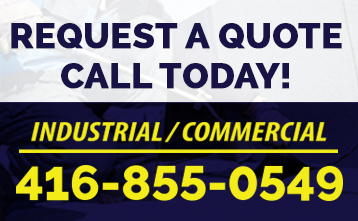 Give us a call, contact us today for a free estimate. Toronto businesses and commercial property owners recognize the value of a trusted partner. 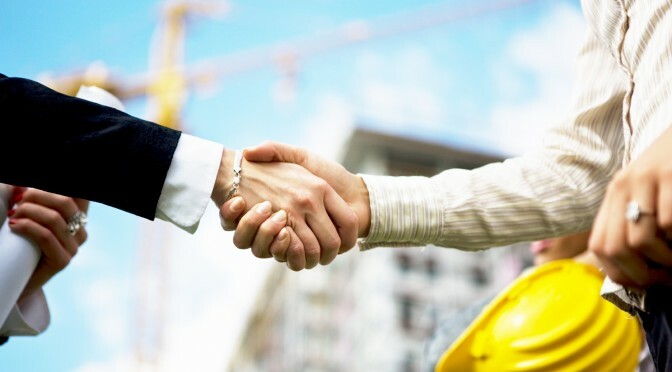 Forming a long-standing relationship with a reliable commercial roofing contractor will help your bottom line by keeping flat roof maintenance and flat roof repair costs predictable. Additional benefits include institutional knowledge of your business’ roof, and more. 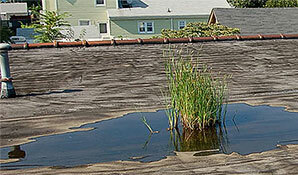 No flat roofing contractor expects commercial property owners to have complete knowledge of their roofs. 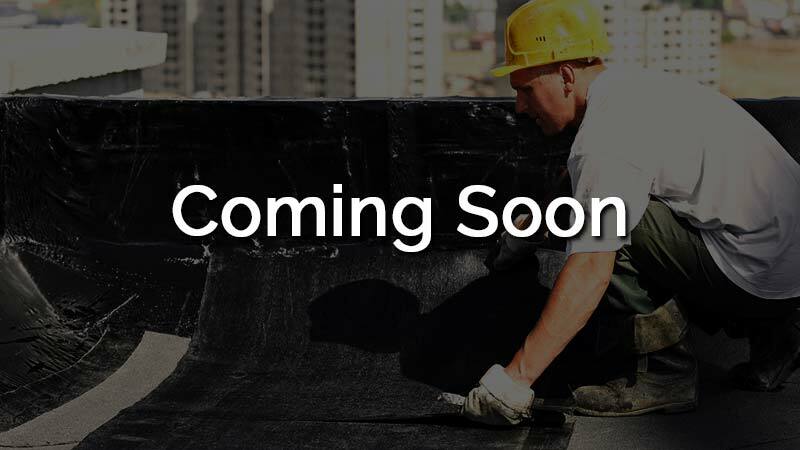 When you build a long-lasting relationship with a trustworthy flat roofing contractor, the roofer comes to know your flat roof better than anyone else. Familiarity with your building’s roofing system saves crew time and money. FlatRoofReplacement.ca has extensive experience with all types of roofing, including energy-efficient modern methods like reflective single-ply systems as well as durable and weather resistant SBS roofing systems. We also know how to get the longest possible service from existing roof materials, such as built-up roofing or modified bitumen. When you hire a roofing contractor for season after season, your flat roof’s gradual wear becomes easier to monitor. 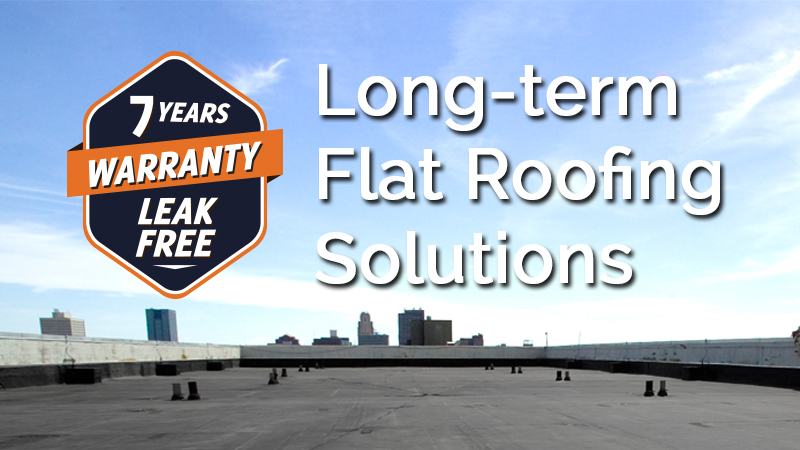 You can work with your flat roofing contractor to plan for future flat roof replacement without feeling a financial or time constraint. The best new flat roofs commercial property owners in the Greater Toronto Area can get are those installed and maintained by the same company. The crew and manager installing the new flat roof will record important details about the roof deck, insulation and flashing. When the same company sends a maintenance crew out, those records will speed up any maintenance and repair work. A new flat roof is a major capital investment. You should not consider giving the job to an untrusted, untested roofer, because you will not know the quality of the company’s work. By forging a long-standing relationship with a flat roofer for smaller jobs, you have the reassurance that the new roof will be done properly. With us, businesses can enjoy another benefit by building a long-lasting partnership—ensuring the warranty stays in force. If you cannot document regular maintenance, annual inspections and proper upkeep, the manufacturer may not honour a warranty claim. By using one roofer for many years, you can protect your investment. From any aspect—maintenance, repair records, warranty preservation, or new roof—you are better off building a long-lasting relationship with a trusted and professional commercial roofing contractor than switching from roofer to roofer. Start today, give us a call!